APA (American Psychological Association) style is a method of formatting often used by students today. If you are writing a research paper or a Cause & Effect essay, you’re more than likely going to use APA style. The current APA essay format guidelines come from the 6th Edition of the APA Manual. As always, check with the official publication in order to make sure you are following the most recent and up-to-date recommendations. You can do that here at the APA official site. APA essays should be type-written on standard white paper, 8.5 x 11”. Margins should be 1” on all sides (left, right, top and bottom). Text should be double-spaced and the font typically recommended for use is Times New Roman, 12 pt. size. The entire paper should be double-spaced throughout. There should be no sections of the essay that are single-spaced. 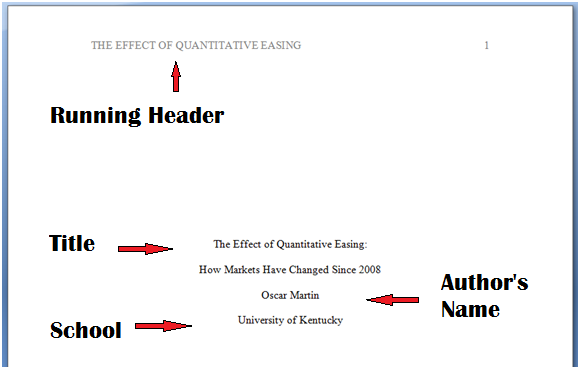 APA formatting typically requires one to include a title page and abstract as well. The running header appears at the top of the title page with the page number on the right. The title page should be followed by the Abstract. The Abstract provides a brief 150-200 word summary of the paper. The title “Abstract” should be centered at the top of the page. The summary itself should be flush with the left-hand margin. The Abstract should give a brief overview of the paper. For most research papers, it will be where the author identifies the subject of the paper, the purpose, the method used to obtain data, the method for how the data was analyzed, the findings, and any conclusions or recommendations that were made. Immediately following the summary should come a list of keywords that best summarize the paper’s topic. In the example provided below, you can see that the term Keywords is italicized and indented five spaces to the right. The keywords follow in lower case letters and are individually separated by a comma. After the Abstract, the paper itself should begin on the next page. The first paragraph of your paper will be your introduction. It requires no heading and should provide simply some background to your topic. It should be followed by the body of the paper, and you will want to use headings and sub-headings to differentiate these parts. Level 1 headings serve as main section headings. Level 2 headings serve as sub-section headings, and so on. In-text citations should be included anytime you are writing a research paper. 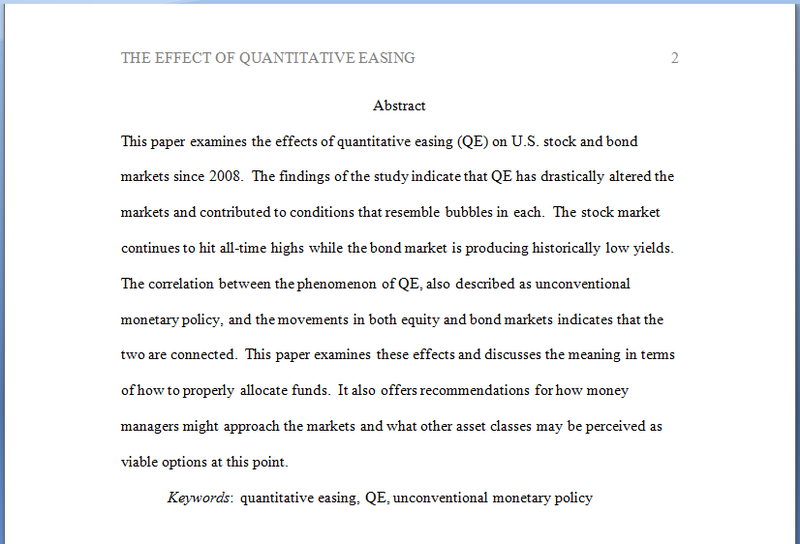 (For more information on how to write a research paper, see our example). In APA, in-text citations are very simple: include the author(s)’ last name, followed by the year of publication, and the page number on which the source material is located. If you are using Internet sources for references, see this citation guide on how to cite websites in APA. Just as African-American churches are making an impact in cities around the country where communities are torn by racial tension and violence, so too did African-American churches rally to the cause in the middle of the 20th century to face and address the same issues (Dagan, 2015). Notice that no page number is given in the parenthetical citation. That is because no direct quote was used. When no direct quote is used, the in-text citation simply requires the author’s name and the date of publication. If the author’s name is given in the sentence, a parenthetical citation giving the year of publication is all that is needed. Dagan (2005) notes that just as black churches are making an impact in cities around the country where communities are torn by racial tension and violence, so too did black churches rally to the cause in the middle of the 20th century to face and address the same issues. Donovan (2013) states that in emergencies, it is okay for people “to use force as this is sometimes all they have” (p. 48). In some cases, when there is no other option, it is acceptable for individuals “to use force as this is sometimes all they have” (Donovan, 2013, p. 48). Beyond practicing empty rhetoric, the majority of them have no idea what they are doing or saying (Garrison, Fuller & Marle, 2017). As Garrison et al. (2017) have shown, the typical politician is simply clueless when it comes to the matter of efficiency. No matter how many times it is argued, the only logical answer is always the same: career politicians are there to collect a pay check—not to make the country better in any meaningful way (Garrison et al., 2017). For more information on how to apply APA style to citations, see Purdue OWL. APA uses a References page to list all the sources used in a paper. They should be listed alphabetically. Akinsomi, O., Kola, K., Ndlovu, T. & Motloung, M. (2016). The performance of the Broad Based Black Economic Empowerment compliant listed property firms in South Africa. Journal of Property Investment & Finance, 34(1), pp. 3-26. Calhoun-Brown, A. (2000). Upon this rock: The black church, nonviolence, and the Civil Rights Movement. PS: Political Science and Politics, 33(2), pp. 168-174. Notice that titles of journals are not capitalized. Titles of journals are capitalized. Proper names are also capitalized in article titles. Kraft, R. (2016). Welcome to the jungle: The art of navigating life’s hairiest situations. New York, NY: Ricardo Press. For sources obtained from the Internet, the title of the article and a link to the page is typically all that’s needed. APA essay format is easy to use and apply once the guidelines are understood. 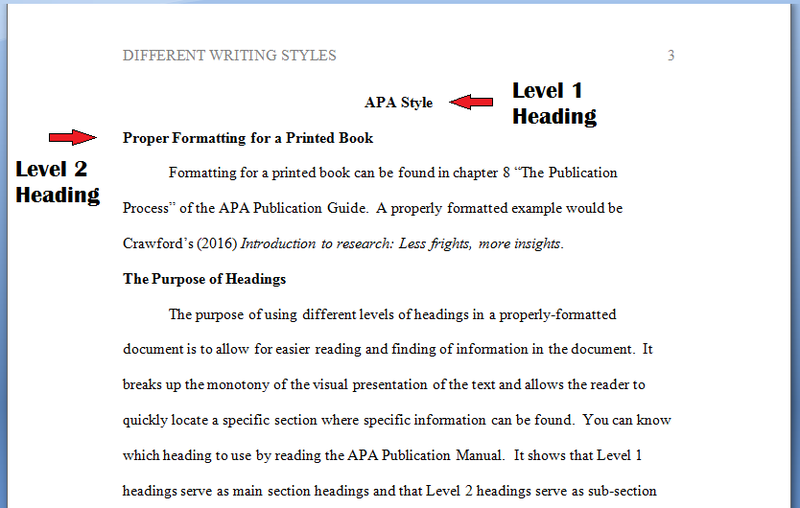 The most important thing to remember when using APA style is the formatting method: title page, abstract, and body of the paper—that’s the basic set-up. A running header should be included on every page along with the page number. The introduction does not require a heading. According to APA, 6th Ed., Level 1 Headings should be centered and bolded. Level 2 should be flush left and bolded. Level 3 should be indented and bolded. In-text citations should include the author’s name and year of publication. A page number should be provided as well if the reference includes a direct quote. The Abstract should serve as a brief overview of the paper and state the subject of the paper, the purpose, the method used to obtain data, how the data was analyzed, what the findings were, and what conclusions or recommendations were made. It should be very concise at about 150-200 words. Don’t put a source on your References page unless you cite it in your document. Use headings and sub-headings to break up your essay and make it more readable. Always make sure you are following the latest APA guidelines: check to see if the Manual has been updated! "How to Write a Paper in APA Essay Format." Aceyourpaper.com. Student Network Resources Inc, 13 October. 2017. Web. 18 April 2019. 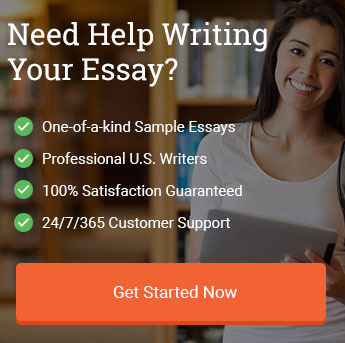 Student Network Resources Inc. "How to Write a Paper in APA Essay Format." Aceyourpaper.com. https://www.aceyourpaper.com/citation-guides/apa/apa-essay-format/ (accessed April 18, 2019).